New Zealand citizens who entered Australia before 1 September 1994 are considered a former permanent resident. They can reinstate that former PR by applying for a Resident Return Visa. New Zealanders must be residing in Australia in order to apply for RRV. New Zealanders can now create an ImmiAccount and apply online. if you need to sponsor family you should consider whether RRV or the new visa for New Zealanders (189) is best for you. The Resident Return Visa application can be confusing. The information below provides some guidance for New Zealand citizens completing their application. The Department of Home Affairs may change the wording or order of the questions. Are you presently in Australia? Yes, New Zealanders must be in Australia to apply for RRV. Date of expected departure from Australia? Write “not applicable”, unless you have an overseas trip planned. Provide your current passport details. All your previous travel is linked to your current passport. convicted of an offence in any country (including any conviction which is now removed from official records)? associated with a person, group or organisation that has been/is involved in criminal conduct? You must declare ALL criminal convictions, including any older spent convictions, and give the details. Failure to do so will see your application declined. It is the total sentence that matters, not just jail time served. If you have ever been sentenced to a total of 12 months or more you will fail the character requirements. Being a member/former member of a bikie gang, or associating with a bikie gang can also see you fail the character test. You will be asked to provide your New Zealand criminal records when applying for citizenship (now only valid for six months). Were you granted your first permanent visa while in Australia? Yes, enter the date you first arrived in Australia prior to Sept 1994, ie the date you were automatically granted Permanent Residency. Request your travel records to confirm your arrival date. Do you currently hold a permanent visa? No. Post Feb 2001 you will be a Special Category Visa-holder, this is a temporary visa under the Migration Act. Date your permanent visa ceased. Have you travelled outside Australia in the last five years? If you have made multiple trips write “multiple trips” and attach your travel records. Home Affairs can look up travel from the Mid-1980s onwards, but you must confirm they have a record of your first arrival date. Have you been present in Australia as a permanent resident for periods totalling 2 years in the last 5 years? Answer No if you are applying for your initial RRV. The Special Category Visa is a temporary visa, not Permanent Residency. Are you the partner or dependent family member of a person who holds an RRV? If your partner has been granted an RRV answer Yes, give their details, and go to Part C. You do not need to provide a statement of your substantial ties. Note: the dependent children of a New Zealand citizen cannot apply for RRV. If they also cleared Australian Customs prior to 1 Sept 1994 they must submit their own application. Do you have substantial business, cultural, employment or personal ties which are of benefit to Australia? Yes. Provide a written statement with as many details as possible about your ties to Australia now. Provide the reason why the applicant wants to depart Australia. If you have any overseas travel plans enter the dates and reason for travel here. Please note, Permanent Visa-holders cannot be outside Austrlia for more than 90 days within 12 months. Are you applying while inside Australia? Yes, New Zealand citizens must be residing in Australia when applying for RRV. Have you been absent from Australia for a continuous period of 5 years since the date you were granted your most recent permanent visa? That is, since you last departed prior to Sept 1994? If Yes, provide compelling reason(s) for your absence in a written statement, then go to Part C. Include as many details as possible. If you have more than one period of absence a reason will be required for each absence, or an ongoing reason. Returning on holiday restarts your period of absence. Visa subclass you are applying for. The visa subclass is 155. The application fee is $375. Check the fee before submitting payment, especially if you have taken a few months to prepare your supporting documents and written statements. New Zealanders can now apply online by creating an ImmiAccount. If you choose to use the paper application form you will be charged the $80 non-internet application fee. You will need to make a payment electronically through the My Payments section of your ImmiAccount. 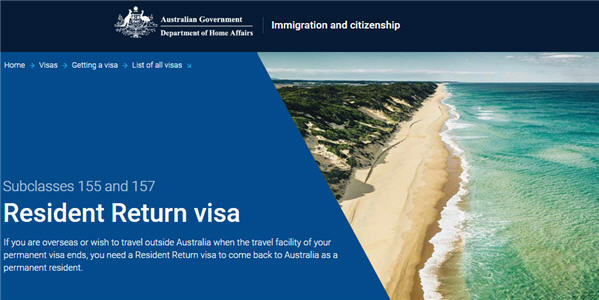 Refer to Resident Return Visa application information on the Department of Immigration’s website. Phone the Department of Immigration on 13 18 81 or contact them via social media. Please do not provide your personal details on a public forum. The above “Completing your RRV application” information should not be relied on as an alternative to advice from the Department of Home Affairs, or a professional immigration services provider.